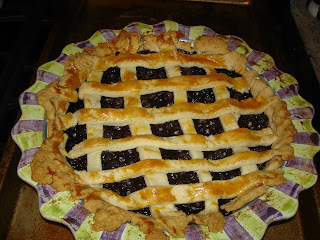 I could not resist posting my blueberry pie recipe. Blueberry pie is my favorite pie recipe and although this is not seasonal (unless perhaps you live in California), it is a nice corollary to the apple pie recipe. First make the pie dough following my recipe for apple pie. Divide the dough into two balls - one for the pie crust and one for the lattice. Prepare the pie crust in the pie dish you are using with one of the balls of the crust dough. I absolutely love the pie dishes at Mackenzie Childs, as they make gorgeous service pieces that are a bit different from your run of the mill cookware. Before you mix the filling you should wash and squeeze the blueberries, by squishing them with my hands. Fill the pie. and then prepare a lattice by rolling out the other ball of dough and cutting into strips. Prepare an egg wash glaze by mixing one egg yolk with 1 T heavy cream. Bake for 20 minutes at 400 F and then for 40-50 minutes at 350 F.